WHITE WIZZARD, the most NWOBHM sounding band hailing from the US is finally back on track with the return of two original members, a brand new album coming in January 2018 and a killer track that will hunt you down NOW! True American Metal band WHITE WIZZARD finally unveil concrete plans regarding their long anticipated new album. Band leader and bassist Jon Leon earlier this year announced the return of classic members, vocalist Wyatt “Screaming Demon” Anderson and guitarist James J. LaRue, to the ranks of White Wizzard, as well as a new label deal with M-Theory Audio. The band have spent much of 2017 crafting their finest offering to date, helmed once again by producer Ralph Patlan (Megadeth, UFO, Flotsam and Jetsam). Entitled Infernal Overdrive, the band’s fourth full-length, will be released January 12th on CD and gatefold double vinyl. The album is over an hour long and captures all the ingredients of past White Wizzard work but expands upon the template with seasoned maturity, outstanding musicianship and a widening of influences including ‘70s hard rock and progressive rock/metal. “We’re very excited to FINALLY release the official artwork and title for our new album, Infernal Overdrive. Despite madness and delays we’ve persevered through hard work and determination and this album has finally come to be,” explains Jon Leon. Expectant fans have waited long enough for the first taste of new music. 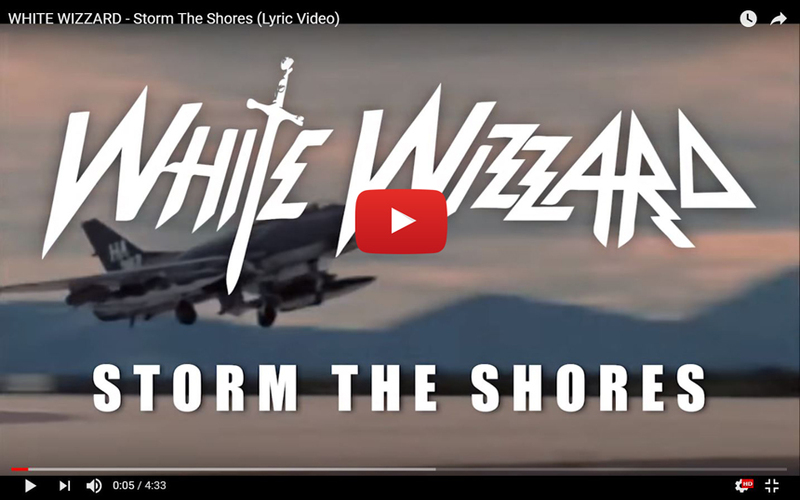 The band is pleased to present the first lyric video, Storm the Shores, from Infernal Overdrive. White Wizzard have announced a handful of special shows in the Southwest to kick off the new release as well as one Show in London March 31st, heating up the Underworld and starting a planned European tour. True American Metal band White Wizzard finally unveil their long anticipated new album! WHITE WIZZARD: new video for "Chasing Dragons" and festival announcement! Epic new video and a date for German fans! This Friday, January 12th, marks the release of the new album from White Wizzard. Today the band is pleased to premiere the lyric video to the album’s heavy metal title track, Infernal Overdrive.